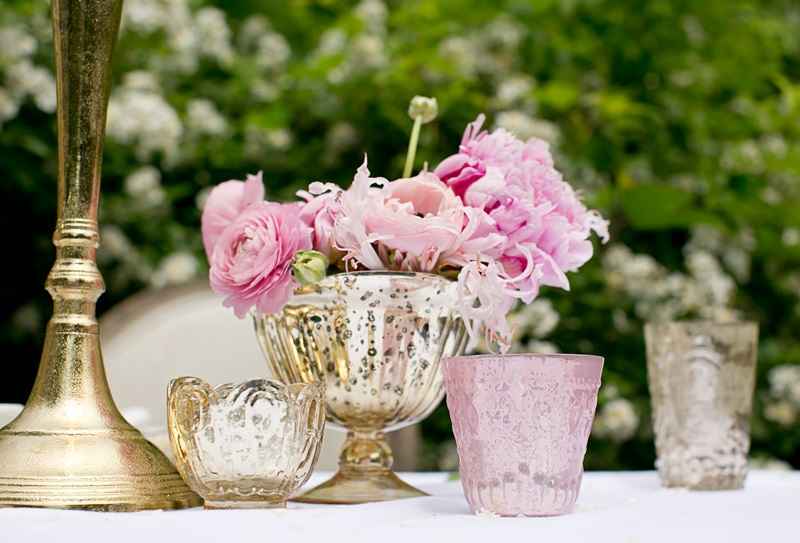 Tarnished silver looks shabby chic especially when paired with different shades of pink and white. Add a touch of glamour to your daily routine by setting a small one on your desk or nightstand. Metal is great for reflecting sun and candlelight, which creates a sublime ambiance for whatever gathering you may be hosting. Sun kissed metal looks magical outside. By incorporating silver linens and mixed glasses at various heights, the table is interesting to look at but still inviting to sit down at. A feeling of grandeur can be emulated by combining fake crystals and stringing them from random vases or chandeliers. And as for Gold, it’s more versatile than you may think. It adds warmth and glamour to cool backdrops and a snazzy flair to home dining. If you’re still worried that metallic might be too formal for your home or party table, try using a more casual shape like a silver mason jar or flower pot. A matte finish furthers the relaxed feel.